When a guy (gender neutral, non-specific term use) has an important message, you listen and you offer a forum for them to spread the word. We met Lance Blair at the 2008 FJ Summit. 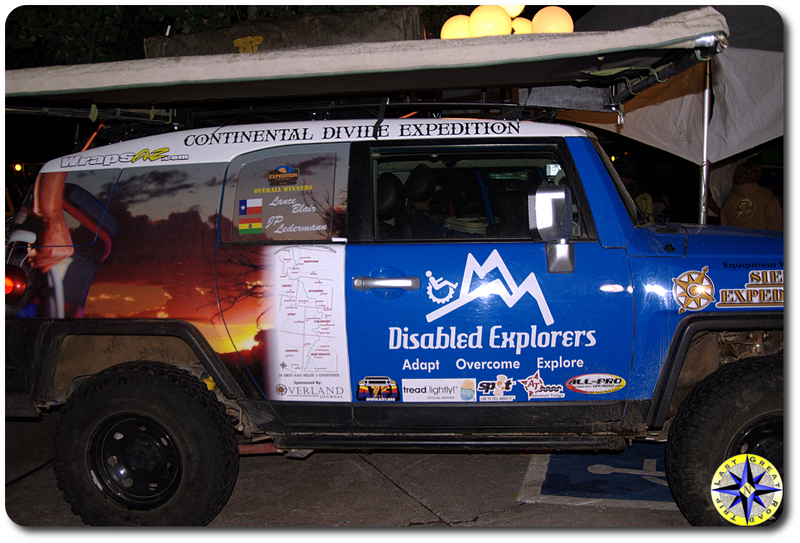 Lance is the founder of Disabled Explores, a contributing writer for FJC Magazine and an accomplished overland adventurer. We are pleased to publish Lance’s words on vehicle dependent adventures. The following is an excerpt from Lance Blairs’ article “A Trip, Adventure, or Expedition”, available now in the October issue of FJC Magazine. We each take a trip when we pull out of the driveway, and those trips sometimes become adventures, but what does it mean to embark on a true expedition? While it’s fun to use the term ‘expedition’ to give our trips or adventures a cool sound, it’s important to know the difference and understand why overlanding is gaining in popularity. The definition from Dictionary.com for trip is long winded, and does not normally excite anyone. That’s OK, because much of the time, it is a “trip” that we took, a day trip, a camping trip, a weekend trip, but mostly something that wasn’t far from home, wasn’t dangerous or hazardous and we returned home as planned. The word “adventure”, on the other hand, stirs the soul and brings a sparkle to our eye. Many of us have had “adventures” with our 4wd’s. Again the dictionary gives us “a bold, usually risky undertaking; hazardous action of uncertain outcome” as the meaning of adventure. Often these adventures aren’t planned, they just happen. These adventures are what we plan and prepare for, yet hope to never experience. Different from a trip or an adventure is something else in the vehicle dependent travel world: an “expedition”. Defined by the dictionary as “an excursion, journey, or voyage made for some specific purpose, as of war or exploration”. Today we consider an expedition in the 4wd world to be an organized journey with a specific goal or purpose. A bit different than a vacation since there will be roles for each person, schedules, work to be done, and results to be presented. Expeditions are less about the journey and more about the task. In truth, the word “expedition” is the word we know and use to convey our desire to do something more than a day trip, something more in-depth than a weekend get-away. We have other words to use like “overlanding” that are more precise and accurate, but somehow have not yet gained the emotional reaction of the word “expedition”. While you often leave home on a trip, and those trips sometimes become adventures, strive for more on your next journey. Plan to go further, stay longer, be away from towns and cities, explore and experience the backcountry. And don’t forget to document it all so you can share and possibly inspire others with your “expedition”. You can read the full text of this article, along with photos in the October issue of FJC Magazine, available right now for free. Lance Blair is the founder and operator of Disabled Explorers, a non-profit organization dedicated to exposing disabled individuals to independent backcountry travel. He’s a regular contributor to the Expedition Portal, FJC Magazine, and FJCrusierForums.com.